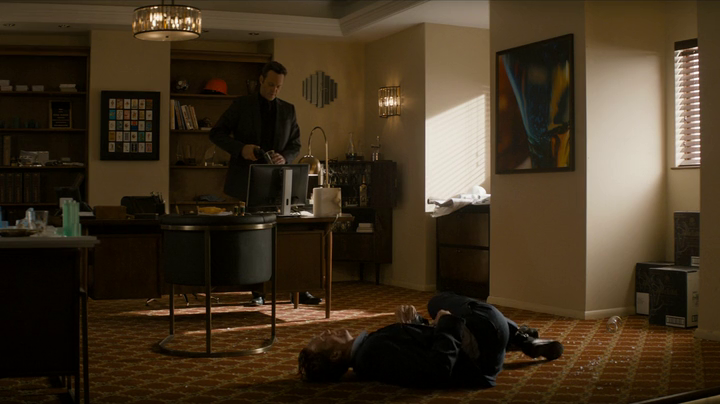 True Detective episode seven is the narrative yin to episode six’s characterisation yang. For weeks, Nic Pizzolatto has been exploring the minds of our four damaged protagonists. Broken families, relationships and promises abound in the City of Vinci, CA. Cops and criminals deal with their personal problems first, before allowing themselves to be diverted by their ‘professional’ obligations. Unfortunately, this has meant the season’s central mystery, the murder of city official Ben Caspar, has taken a backseat to the genuine intrigue surrounding the turbulent lives of Frank Semyon, Ani Bezzerides, Paul Woodrugh and Ray Velcoro. Aside from two impressive set pieces, (the shootout in episode four and the undercover raid at the party last week) most of this season’s drama has been fuelled by characters colliding through conversation, usually with a drink in hand. It’s been implied for a few weeks now that Mayor Chessani’s son and various other elements of the corrupt Vinci hierarchy are behind the murder – all it will take is for the cops to work out the finer points of the land deal/high-class prostitution/stolen diamonds sub-plots to put it together and boom, mystery solved. As there are only eight episodes in the season, this was all going to have to happen over the course of the final two weeks. This is where we find ourselves now – the cops have fled the scene of last week’s party, and are regrouping in a motel. The triumphant feeling of the escape has faded as Bezzerides recovers from her drug-induced stupor. She’s clearly shaken by what she witnessed, and the memories of abuse that were stirred up by it. Velcoro is watching over her, and at one point she almost reveals her traumatic past to him. This is another, more vulnerable side of Bezzerides we haven’t seen before. Until last week she’d been the confident cop that could handle almost anything that was thrown at her. Yes, she’d been affected by the immediate aftermath of the shootout, but the position in which she placed herself at the party was the sort of helplessness she’d been striving against since she was abused at a young age. She even admits to Velcoro that she’d been waiting her whole life for an opportunity to use her knife skills. Looking for comfort, she makes a pass at Velcoro, which he gallantly declines. As with her transformation last week, it’s refreshing to see Bezzerides exposed like this, offering Rachel McAdams the chance to explore a different aspect of the character. Bezzerides, Woodrugh and Velcoro examine the contracts they found at the mansion and start to piece together the case surrounding the Caspar murder. They talk through the connections between the diamond robbery, Vinci PD, Caspar and Tony Chessani. This is all fairly expositional and could probably have handled in more of a ‘show, don’t tell’ fashion throughout previous episodes. Velcoro takes their findings to Davis (their insider within the State’s Attorney’s office) only to discover that she’s been killed. In another classic undercover cop trope, Davis was our protagonists’ only contact, which conveniently means that they’re on their own. Now, in a well-worn but interesting twist, both Velcoro and Bezzerides find themselves sought by the law. Bezzerides for killing the security guard at the party; Velcoro for Davis’ murder (he deduces that he’s been framed). 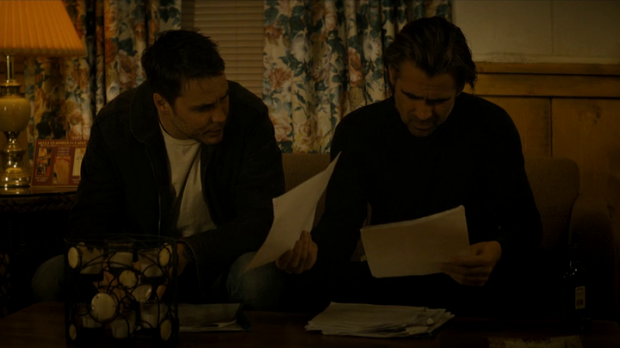 The exposition about the intricacies of the Caspar case is necessary, as until now this plot thread has been meandering in the background of the show, as a backdrop to Pizzolatto’s impressive character work, however it feels as though he’s shoehorning too much of the narrative into this episode. The connections between the various parties could’ve been eked out over the previous few weeks, without spoiling any of the subsequent revelations. Instead, it seems we’re supposed to have arrived at some moment of clarity, when actually we’re just having everything spelled out to us. Velcoro finds time to check in with Frank Semyon, and reveals to him that Tony Chessani and the Russian gangster Osip, have screwed him over. Velcoro lets Semyon know that he still wants the man who destroyed his life ten years ago, but disappointingly, this scene lacks tension. The relationship between the two men has been established well in previous episodes, and they’ve metaphorically butted heads before, however very little of this is evident here. Perhaps this is to convey that they have bigger problems to deal with, but it would’ve been nice to see Farrell and Vaughn square off (however briefly) again. Vaughn does get the opportunity to flex his acting muscles in a scene with one of Semyon’s men, Blake, whom he’d previously suspected of treachery. When questioning Blake, Semyon is incredibly threatening, despite remaining calm and reserved for most of the encounter. Vaughn manages to convey Semyon’s power and menace through words and looks, and when he does resort to violence, he manhandles Blake with terrifying ease. Semyon’s cold-bloodedness rises to the surface as he calmly knocks back a drink whilst watching his man die. He also chooses not to hide his actions from his wife, allowing her to witness what he’s had to do to keep them safe. As an exit strategy Semyon begins planning his departure from Vinci, arranging travel plans and strengthening his underworld connections against the Russians. The Jewish mafia and the guys with a cake shop for a front provide lighter touches to a season that is growing darker week on week. As a final act, Semyon torches his clubs and properties (including The Most Depressing Bar in the World™), to stymie the Russian effort to move in on his territory. Early in the episode we see Woodrugh receive blackmailing texts, containing pictures of his homosexual tryst. He’s understandably troubled by this and ends up arranging to meet the blackmailer, who turns out to be his lover, now working for Ares Security – a company involved with Catalyst. It is suggested that the affair was a setup, used to collect dirt on Woodrugh for this very purpose. Vinci Police Chief Holloway is behind the blackmail and wants Woodrugh to give up Velcoro and Bezzerides. Just as Woodrugh is reaching for his phone to call Velcoro, he springs into action, subduing Holloway and escaping from his men. After a short but tense chase and shootout, during which Woodrugh once again displays his capability as a soldier, he appears to be in the clear. He does pause for a moment to consider his fallen lover, who was killed in the exchange. This was an entertaining sequence, capped off by Woodrugh’s confusion and despair at his lover’s deception. Kitsch does a good job here, and we really feel that Woodrugh is physically and emotionally drained by the ordeal. Overall, this sub-plot was confined to this episode, with only a hint of foreshadowing in previous weeks, and because of this didn’t feel as connected to the rest of the narrative. Again, this is disappointing, as there was plenty of opportunity for this to have been woven in earlier in the season. Meanwhile, back in the motel room, Velcoro and Bezzerides are sharing a drink, and their pain. Long looks are exchanged, punctuated by few words. They gaze at each other, and then nervously away; the scene brims with emotion. They embrace, kiss and move to the bed. As they do, the score shifts to an unsettling piano melody that creates an ominous atmosphere over shots of the couple. The music plays on as Semyon watches his world burn, and finally, as Woodrugh runs in slow-motion from the building that served as his trap, he’s ambushed from behind by Burris (one of the other dirty cops involved in the diamond theft), and is shot twice in the back. The episode draws to close with a fade out on Woodrugh’s body. We’ve seen this before with Velcoro, but this time it seems pretty final. There’s one episode left – Velcoro and Bezzerides are on the run and have sought solace in each other; Semyon has burnt his bridges. Their stories have one week to be resolved; Woodrugh has reached the end of his. It’s been good to see the narrative strands finally coming together, but this all feels a bit rushed. The central trio of cops has been truly broken, with both Bezzerides and Velcoro on the run, and Woodrugh left for dead. Thankfully, we get to see more of Bezzerides’ vulnerable side as she turns to Velcoro for comfort. Semyon has been flushed from his flimsy position of power and will presumably seek vengeance against the Russian mob from a safe distance. His dismantling of Blake was some of Vaughn’s best work this season. The introduction of the blackmail plot against Woodrugh, along with the other aspects of the narrative that were hurriedly dealt with here makes this episode a slightly disjointed experience. The sub-plots of the Caspar mystery have been linked, but this will be difficult for our scattered protagonists to resolve from their separate hiding places. The groundwork for a fine finale has been laid (albeit somewhat unevenly) over the past seven weeks. Will there be a satisfying conclusion? True Detective season one ended on a surprisingly upbeat note, which was not universally well-received. Great television should be divisive; let’s hope we’re all arguing by this time next week.